Three months to the day after they held the official groundbreaking ceremony, workers began to lay new rails on the extension of the Virginia & Truckee Railroad. During that three months they’ve torn down a mountain, filled in a pit, graded the right-of-way to just the perfect slope, and laid down gravel for the trackbed. Now the rails are going in place, and probably within another month the new track will be ready for trains to roll across it. This is a fantastic rate of progress for a project that has been stalled for decades. We can only hope that the remaining phases go as quickly as Phase One has. The article in the Nevada Appeal is another good one by Becky Bosshart, and it mostly focuses on the trackworkers, the ones who are actually out in the sun, swinging hammers to drive the railroad spikes. The company doing the work is RailWorks, and the impression you get from the article is that the work is intensely physical, involving heavy sledgehammers, broken mauls, and unforgiving steel rails. But the workers also have to be highly skilled, since placing the rails just a few inches too far one way or the other can cause a derailment. These guys are laying 350 feet of track every day, and each inch of it has to be just perfect. Also in V&T news, the Nevada State Railroad Museum brought out its prize engine over the 4th of July weekend, the wood-fired #22, the Inyo. This 130-year-old locomotive is one of only a handful of remaining engines from the old V&T, and she usually only comes out for special occasions. She always makes an appearance on the 4th of July before heading back inside her barn. The Inyo on the track in front of the Nevada State Railroad Museum, pulling a few passenger cars. A closeup of the Inyo. 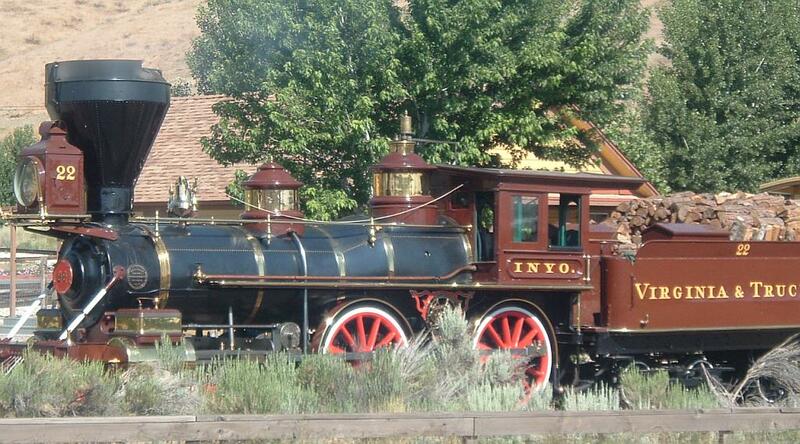 The Inyo is much more fortunate than another surviving V&T locomotive, the Reno. Built in 1872, the Reno pulled the first scheduled train between Reno and Virginia City, and proceeded to serve the V&T for decades to come. But then many of the V&T engines, including the Inyo and the Reno, were sold in the mid 1900s when the railroad hit hard times. They were sold to movie studios, and did time as “movie trains”, appearing in films like Union Pacific and How the West Was Won. But while the Inyo eventually made its way back to Carson City, the Reno ended up at Old Tuscon studios in 1970, and there it’s stayed ever since. In 1995 Old Tuscon was devastated by fire, and the Reno was badly damaged. But soon she was called into action for another movie, Wild Wild West. The movie people agreed to repair the fire damage and restore her to her historic appearance, and today she is advertised as the star of Old Tuscon, even if she is no longer operational. Not everyone agrees that Old Tuscon is the best place for the Reno, though. Some people think she is being forgotten and neglected in Arizona, and that she deserves to come home to Carson City. Out of all the locomotives that ran on the V&T, only two are still operational today. The Inyo, and V&T #25, which is brought out at the Railroad Museum on not-so-special holidays like Father’s Day. These original V&T engines won’t be running on the new track up to Virginia City once the line is completed. The little oval of track they have at the museum won’t connect to the new rails that are going to terminate on Carson City’s east side, and the Railway Commission already has a steam engine they bought from McCloud Railroad which will be making the daily runs up the hill. So even though the Inyo probably has a long life ahead of it, it most likely will never get to ride the rails up to Virginia City again. There is one engine that will get to make the trip back up the hill, but it won’t be doing it by rail. In August, V&T #18, the Dayton, will be brought from the Railroad Museum to Virginia City by flatbed truck to be put on display at the new Comstock History Center. The Dayton isn’t operational, though, so it won’t be running up and down the rails. It will just be sitting as a museum piece. And the plans are, in a couple of years, to bring it back to Carson City and swap it out for V&T #27, another non-operational engine. The funny thing about #27 is that while it never went up to Virginia City while it was operational, it did sit on display on E Street in Virginia City for many years in the late 1900s before being brought down to Carson City for restoration. So it looks like Virginia City’s about to get overrun with trains once again.